Romford RM Home & Office Window Cleaning | Quality Property Care Ltd.
Do not miss the opportunity to finally get rid of the long-lasting and dangerous residential or domestic professional cleaning job. Count on our professional window cleaning company! We would certainly be happy to assist you. Contact our kind and helpful customer support representatives via this phone number 020 3746 4287 and get all the information you need right now! Quality Property Care Ltd. company performs in the entire Great London area, cleaning commercial and domestic properties inside and out. Our technique is able of cleaning even the filthiest of windows. We work with single and double windows, conservatories and conservatory roofs, small bay windows, big bay window, garden windows, skylight windows, sunroofs, sash windows, American style windows, French doors, Victorian style windows and quite a lot more. We also clean sills and frames, only if they are PVC, we do no move or restore anything. 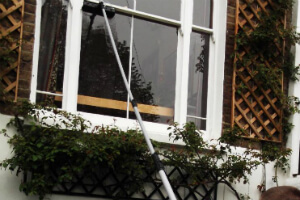 We are delivering a suitable outside window cleaning for shops, big bay windows, displays, domestic buildings up to 4 stories in height, conservatories, garden windows and even gutters and patios. If you have a store on a busy street and want that window cleaned, we can accommodate your needs, no hassle or extra fees. We take our own equipment, fully equipped to tackle any stain or window cleaning situation that you want fixed. We bring ladders, towels, detergents, gloves, squeegees, vacuum, dirt extractors, telescopic poles for the squeegee and some pure water. To keep the inside of your property or home clean, our staff uses overshoes to minimise the dirt exposure of the windows. Depending on the stains in question, we use a detergent or simple water . Sometimes a wipe down with a micro fiber cloth to remove fingerprints is enough. This is done using our water purification system connected to a water fed pole. The entire system sits compactly in the van, allowing for flexibility. A water purifier strips regular tap water off of its minerals and other chemicals, leaving it a bare H2O compound. This type of water is known as purified water, it attaches a lot more quickly to dirt and grime due to its denaturalized state. There is no trick, no smoke and mirrors, just simple pure tap water removing accumulated grime and dirt form your windows. Our cleaner starts from top to bottom, initiating with proper window frame and sill cleaning to removing any grit and debris, then he moves onto the glass itself. If the day is especially windy we hand dry the window with cloths to prevent further saturation. So whether you are in dire need of the professional commercial windows cleaning service or the home windows cleaning service delivered by Quality Property Care Ltd., all you need to do is book the service or services you need, and you will make sure that the light shines brighter in your office or home again. The services delivered by Quality Property Care Ltd. are certified and authorised by a number of institutions and agencies, and are recommended both as a commercial window cleaning service and a domestic windows cleaning service. The windows on all kind of commercial properties and domestic properties can be cleaned, if they are accessible. For higher floors the enterprise will provide a well-equipped and skilled rope access window cleaning crew.You can order sticker removal in addition. The only demand for the windows cleaning with the help of the water fed pole, is that there is an accessible parking spot for the company’s van at a range of less than 30 meters from the windows. The reason is that the tank with purified water is in the van, and it is where the water is pumped out of. Don`t waste time, but call us on 020 3746 4287! Get a free quote right now! See our budget-friendly rate list and get a reservation for safe and helpful window cleaning in Romford RM right now!